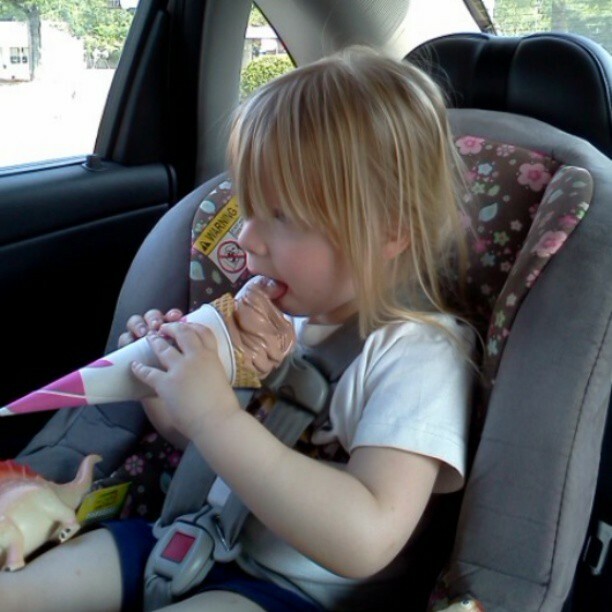 Ice cream makes it all better, especially when your eating mommy’s ice cream cone. I bought her a cup of ice cream and myself an ice cream cone. Guess who ate the ice cream cone and who didn’t? This entry was posted in Blog and tagged children, hot days of summer, ice cream, kids, my daughter, single mom, single parents, toddlers on July 7, 2013 by JenniferNAdams. That looks delicious! So cute! thats cute. very familiar to me. my girl does the same thing when we buy ice cream. I had a good laugh with this. I hand my nephew the cup of ice cream and tell him to help my daughter with it. I then take one good lick of my cone and she cries out, “I want chocolate cone!” I just had to laugh because I knew better than to get her the cup as she loves the cones. I was trying to make it easier as we were in the car. Too funny though. I don’t mind sharing.